The new U2 album, Songs of Experience, came out today. For the last several U2 albums, I’ve blogged my impressions as I listen to the album for the very first time. It’s a silly thing to do because I’m not very good at writing about music. But I like capturing my first impressions and then coming back later to laugh at my first take. Love Is All We Have Left – Weird slow intro. The reverb vocals are even weirder. Sets a unique tone for the album, thought not sure I like it. Lights of Home – Sonic shift from that opener. Seems to have a different feel from what I expect from a U2 song. I like the chorus better than the verses. “Free yourself to be yourself” bridge with the piano is interesting. Get Out Of Your Own Way – The intro music feels so U2. The intro vocals are a little weird and breathy… ah, there’s Bono. The breathy part of the “Get out of your own way” in the chorus is kind of weird… and that’s a mouthful.. but the rest of the chorus is great. I like the repeats. “Nothing’s stopping you except what’s inside, I could help you but it’s your fight.” Hearing this again (it was released early), I like the rhythm in the verses. This feels like a quiet favorite. American Soul – The beginning of this does not sound like U2 at all. That guitar sounds a little more U2, but it’s different. I like it. The chorus sounds like another U2 song, I can’t place which one though. Summer of Love – This is slower and somehow more melodic. I liked the bridge, I was waiting for some soaring vocals but we barely got those. Meh. Red Flag Day – Seems like a very different album rhythmically, and I don’t mean drums and base but the rhythm of the vocals. This one feels catchy. The Showman (Little More Better) – Nice: “Singers cry about everything.” This reminds me of a song I hear on the radio and think, “That’s dumb, I don’t like it.” Some phrasing or the way they sing something seems annoying. But they keep playing it, and I start to like it. I don’t get that feeling often from a U2 song, but this song is totally it. The Little Things That Give You Away – This is the slow verse U2 song that’s itching to turn into an anthem on the chorus. We get hints on the first chorus, we’ll see if it picks up as it goes. The bridge sounds familiar (like another U2 song I can’t place). Now it’s picking up. I’m curious to see how this one holds up to repeat listens. Landlady – This song really didn’t catch my attention, until the last minute or so. That part felt catchy. Otherwise meh. The Blackout – The beginning sounds like several different old U2 songs (again, I can’t place them). Love the bass. I love these driving rockers. Second verse, is this about Trump? Seems like this one will be better live. Love Is Bigger Than Anything in Its Way – Sometimes it’s just interesting to hear U2 make music. They’re trying to do new things, not just cranking out more U2-sounding songs. That doesn’t always work. This song feels like that kind of experimentation. Parts of it work, parts of it don’t. Parts of it feel familiar, parts of it feel unique. 13 (There Is a Light) – Is this our quiet album closer? The chorus is super familiar—where have I heard this before? Is this a reprise of another song? Oh there, it is, “A Song for Someone” from the last album. Interesting choice there—I’ll need to compare these versions. It’s always hard to judge a new album after hearing it for the first time. Am I liking it just because it’s U2? Is it initially catchy but won’t last? I think it’s fair to say U2’s last several albums haven’t been major hits. How to Dismantle an Atomic Bomb seems like the last one I thought, yeah, I like that. No Line On the Horizon still feels kind of fuzzy in my mind (what are the hit songs? None? “Moment of Surrender” and “Magnificent” are my favorites, but probably not hits). Songs of Innocence likewise felt short on hits (though “The Miracle (of Joey Ramone)” got radio play and is probably my favorite). Songs of Experience feels lacking in a signature single. I like “The Blackout,” but other songs feel like they’ll need to grow on me. 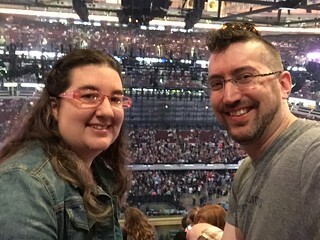 Last weekend Abby and I traveled to Chicago to see U2’s Innocence and Experience tour at the United Center. We saw the Sunday, June 28 show and it was pretty amazing. 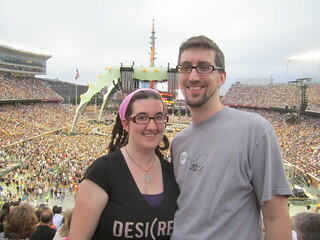 It was our fourth U2 show, and while nothing can beat watching U2 during a rainstorm, this was pretty good. I’m continually amazed with their stage setup. They had a walkway down the middle of the arena, with a video screen/catwalk that could be raised and lowered. So at one point The Edge is walking along the walkway while Bono is walking towards him on the catwalk, 10 feet higher in the air, with a video screen around him that makes it look like Bono was walking down the street. U2 also played a great mix of songs, playing a lot from the new album (7 songs total) but also playing all the old favorites. I had a hard time coming up with a classic song they didn’t play (“I Still Haven’t Found What I’m Looking For” is probably the one I missed the most, but they hit so many others and have so many classics, seems like a win to me). They also included some they haven’t played much, including “Gloria” (not played live in 10 years) and “Lucifer’s Hands” (a b-side for the new album they’ve only played live once before). 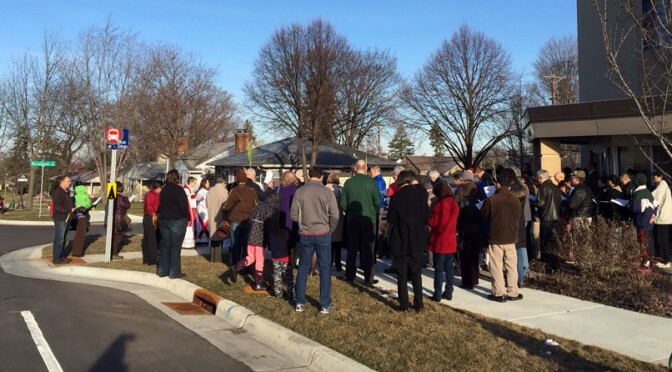 The show was on Sunday, June 28 and the Friday before the U.S. Supreme Court had issued its historic ruling on gay marriage. 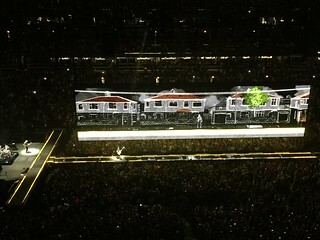 This was the first U2 show since the decision and it was referenced a coupled times. During “Pride” a rainbow flag landed on the stage that Bono twirled around before shouting, “Gay pride in the name of love!” Then he urged the crowd to sing for Baltimore, Ferguson and Charleston, referring to the on-going racial violence in the U.S. While introducing the final song, “One,” Bono again returned to gay marriage: “Why would you be against anyone committing their lives to each other?” He dedicated the song to Chicago’s Pride parade that happened that day and put in a little dig that Ireland passed gay marriage before the U.S. (“We put the gay in Gaelic”). All in all it was a pretty amazing show. Lots of energy, lots of heart, lots of rock. I can be pretty fanatical about my love for U2. Since 2000’s All That You Can’t Leave Behind, their music has been fiercely personal and deeply spiritual for me. So yesterday’s surprise news at the Apple event that U2 was releasing a brand new album and giving it away for free? Incredible. There was a mad scramble as 500 million iTunes users powered up the program (many of us for the first time in a long time) and tried to grab the new album. Once I finally got it downloaded, I had to sit back and let it play. The last time a new U2 album came out—2009’s No Line on the Horizon—I sat at the kitchen table and streamed the entire thing on MySpace (yeah, remember MySpace’s short-lived second life as a music site?) while waiting for news of my son Milo’s adoption. U2’s music is special, and that first listen is always interesting. I like to grab my initial thoughts on a new U2 album. It’s funny because it’s hard to judge music on a single listen. The songs you hate at first grow on you. The songs you loved can get tired. So you end up being wrong. But it’s still fun. I did it with No Line on the Horizon and before that with 2004’s How to Dismantle an Atomic Bomb. What’s perhaps most interesting about this album is that U2 has been working on putting out an album for ever. Bono has said they’ve recorded several albums, they just haven’t released them. And now they drop the album with very little warning. If you were following the rumors, there was talk that we’d get a new album in 2014, then in September, then a week before the Apple event there were unconfirmed rumors about U2 being involved. But we never had a single, never had an album name, never had a date and the Apple rumors were denied right up to the day. It’s a very different release strategy (compare it to the hype for How to Dismantle an Atomic Bomb, which also included a big Apple partnership). The album is also being described as a very personal one, reaching back to U2’s roots as teenagers. It feels bold and joyful, crisp and fun. I love the guitar, love the driving beat. I like the line, “Music so I can exaggerate my pain.” Really like the abrupt end. I like the sonic feel of this album. It reminds me of “Miracle Drug.” But it has a deeply melancholy feeling (I read later that Iris is Bono’s mother, who died when he was 14). I like the thumping bass. It has that ‘garbage can’ feel reminiscent of “All Because of You,” though this is a little more polished. I like the driving beat. The album seems to get darker and grittier from here on. Wha? Weird keyboard stuff at the start. This one is dark and ethereal. I like the falsetto on the bridge: “Hope is where the door is / When the church is where the war is.” I don’t know what that means, but I like it. More of the gritty sound. This one is fun. I like the “choir-ish” vocals. It doesn’t sound like U2 and I love that. I like the guest vocals from Lykke Li. Bono is amazing, but I wish they would experiment like that some more. This is a dark closer, but it’s hopeful. I like how it ends. I’m not sure what I think of the whole album. No Line on the Horizon was a so-so album, and I think there are elements of that here. But it also feels like they push past that and create some better stuff. I’m still not sure if I have some standout songs. I like “The Miracle,” but it doesn’t strike me like other singles have. Not yet anyway. I do like the thematic approach. They feel like more personal songs. Anyway, there it is. New U2. Check out RollingStone‘s song-by-song take and their interview with Bono. The first single from U2’s new album, No Line on the Horizon, is now available. The song, “Get On Your Boots” is being streamed from U2’s web site and is available for purchase on iTunes. No Line on the Horizon comes out March 3, 2009. You can buy just the single for 99 cents, or pre-order the album for $9.99 and you can download “Get On Your Boots” today. The pre-order version of No Line on the Horizon includes two bonus tracks (one is an iTunes exclusive, the other is a pre-order only, but no details on what either one is). You can also pre-order the deluxe version of the album for $17.99 from iTunes, which includes the two bonus tracks, a film from Anton Corbijn and a digital collector’s magazine. Q previews the new album, comparing it to Achtung Baby in spirit and offering hints that producer Brian Eno and guitarist the Edge think it may be U2’s best album. Rolling Stone offers a track by track appraisal of the new album. Hmm… I sense a theme developing. OK, so I’m still playing around with Squidoo’s new Plexo thingy. This time around, let’s vote for our favorite U2 songs. It’s a much broader field than the Five Iron list and probably appeals to more folks. Plus this time around you can add your own suggestions. I threw in a handful to get started, but it’s far from all the best songs. If you can’t see the list, check out my U2 lens to see it and vote.